Chewing is a natural behavior for dogs, and it does have positive effect on dental health. Since many of the chewing teeth are beyond our reach to brush, I like to think of chewing as the dog brushing his own teeth! Some dogs are such intense chewers that pet owners struggle to find objects that that last longer than a few minutes. So we look for more durable chews. They cost a little more, but they last longer. Seems logical, right? in the bone, at the tip of the tooth root. Dogs are quite stoic. They continue to eat until the pain becomes unbearable. We are not aware of the dog’s pain until the abscess becomes a full-blown, face-swelling, pus-draining mess. The point of this is not to discuss tooth abscesses--it is to prevent them. 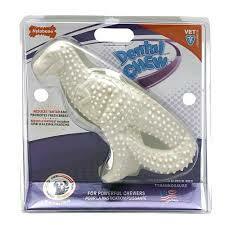 We can keep our dogs’ teeth safe by choosing appropriate chew objects. Use caution with edible chews, as they start out rather hard, but soften. If your dog likes to dive in and chew with vigor, consider softening them a bit in some warm water before offering them to the dog. With any product, first use them under supervision to make sure the dog is not trying to swallow large pieces. Edible chews will dissolve in the stomach, but a chunk lodged in the throat or esophagus is an emergency.